Daimler Chrysler revealed its new Smart Roadster and Roadster Coupe in Berlin today. Both cars will go on sale in mainland Europe in April at prices from 15,000 Euros after tax. Higher spec, more powerful RHD versions will arrive in the UK next Spring at prices estimated between £12,000 and £13,000. With a turbocharged 80bhp 698cc Suprex engine, sequential six speed semi-automatic box, light weight of just 790kg and either 185/55 R15 or 205/50 R15 tyres they promise to be a real hoot to drive. Cheap optional steering wheel paddleshifts overcome the clumsy back-to-front Tiptronic gearshift, always with the option of simply leaving it in fully automatic mode to self-select. Top speed is estimated at 112mph, 0-60mph in 10.5 seconds and combined fuel economy at 51.36mpg. The cars are 3,427mm long by 1,615mm wide by 1,192mm high. Long spring travel should mean a comfortable, compliant ride. All Smart Roadsters and Roadster Coupes have ABS, Electronic Brakeforce Distribution, Cornering Brake Control and Electronic Stability Programme. Drivers and passengers sit in steel bucket seats protected by twin airbags and an extremely rigid Tridion safety cell like the Smart City Coupes. 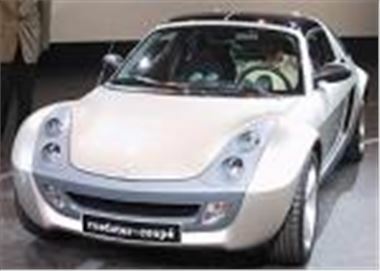 The Roadster comes with a convertible top, or twin removable roof panels as a no cost option. Luggage space is 59 litres in the front boot and 45-86 litres in the rear. The Roadster Coupe comes with a standard removable hard top or optional soft top. Luggage space is 59 litres front, 104-189 litres rear. Both can be ordered with an optional retracting soft top which can be raised and lowered at any road speed. A Sports Option Pack offers three spoke leather rimmed steering wheel with paddle shifts and 205/45 R16 Spikeline alloy wheels. A Safety Pack consists of fog lights, side airbags and electrically adjustable and heated door mirrors. A Comfort Pack provides cruise control. Electric power steering and trip computer. Other options include heated leather sports seats, extra instruments, CD changer and paddle shifts. Later, a quicker Brabus version will be offered. In launching the car ahead of the Ford Street Ka, Daimler Chrysler harked back to traditional English sportscars like the Austin Healey Frogeye Sprite. But really the Smart Roadster and Roadster Coupe are closer to the original FIAT X-19 and Toyota MR2, brought up to date and without the rust. They could provide the first serious competition to the MINI.